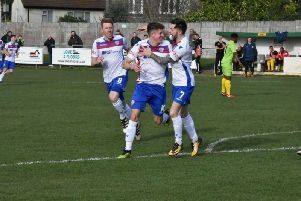 AFC Rushden & Diamonds returned to winning ways as they edged out Hitchin Town at Hayden Road on Tuesday night. Diamonds are pretty good at responding well to setbacks. This has become a bit of a trademark of Andy Peaks’ team over the last few years so this isn’t necessarily something we learned, more like something we were reminded of. Taking away the NFA Hillier Cup win over ON Chenecks for a moment, Diamonds came into this midweek clash on the back of their first home loss of the season and the FA Trophy loss at Witton Albion. No cause for panic, of course, but it’s always important to ensure a couple of defeats don’t turn into a run of them. Diamonds have had a useful knack of bouncing back from their setbacks in recent seasons and they did it again on this occasion. It’s a credit to Peaks, his staff and the players that they are able to do it when they need it the most. Andy Peaks was right, his team’s game management could be better. Even in defeat, there’s always something that can be taken on board and the manager was quick to point it out in his post-match interview. Diamonds were good value for their 2-0 lead after 53 minutes and, from there, it should have been a case of seeing the game out. 2-0, so they say, is always a tricky scoreline and while Hitchin deserve credit for getting themselves back into it, Diamonds did drop a bit deeper than they probably needed to. The visitors were happy to be patient. They weren’t just lumping balls forward in the hope that something would drop for them. Diamonds allowed them to play in front of them and it could have cost them towards the end. Sometimes, you just have to slow the game down and Diamonds didn’t do that when they had the chance to. Picking my man-of-the-match was tricky this time. Diamonds are a side who pride themselves on always making sure it is a team effort. They have got themselves up the divisions with a big collective effort and they are now more than holding their own at Step 3 with the same mindset. Such was the collective effort again on this occasion, it made picking the man-of-the-match that bit harder. There were three who stood out for me. Nathan Hicks was excellent in the middle of the pitch and was in possession of two assists by the end of the evening. Zack Reynolds had bundles of energy at right-back and posed a threat in attack while defending resolutely. But in the end, I went for Jack Ashton. He is back and looking like he has never been away. A ferocious competitor who, as he said himself, leaves everything on the pitch. This ended up being the sort of game that I reckon he relishes. A big defensive effort was needed and he led the way. But the fact there were many contenders for my prestigious man-of-the-match award says more about the team than it does about the individuals. This was a good win, Hitchin are better than their league position suggests. A Step 3 club doesn’t reach the first round proper of the FA Cup without having something about them and Hitchin showed enough in this game to prove that their league position is somewhat false. They really made Diamonds sweat after pulling a goal back when they were 2-0 down and had a good argument that, by the end, they deserved something from the game. They also have in their squad one of the better players I have seen at this level this season in Isaac Galliford who really pulled the strings for them. On this evidence, Hitchin will be good enough to lift themselves away from the bottom end of the table. And that fact alone makes the end result look even better for Diamonds. A tricky run is approaching, this weekend’s home game is crucial. It’s important Diamonds follow up their win over Hitchin with another on Saturday. They take on rock-bottom Bedworth United at Hayden Road and while the visitors arrive without a league win to their name, it will be important to ensure no complacency creeps in. I’m sure the manager will make sure his team are focused on the job. And another victory would really set Diamonds up for a tricky run. As it stands, they now go into four away games in a row while they have just one more home match after this weekend before they take on St Neots Town on Boxing Day. It’s always tough going on the road but Diamonds can take the pressure off themselves with another good performance and result this weekend.